It had been months since my children were all home and I couldn’t wait to be with them. Max had started his first job teaching high school history and coaching basketball. He stayed at his dad’s house during the week (since it was closer to his work), and came home on weekends. Noah and Raquel were both in school at the University of Illinois-Champaign Urbana and I hadn’t seen them since January. They came in for spring vacation, and Raquel had been sleeping in my room the past four nights. Raquel went into her room and I fell asleep watching TV. Noah was downstairs at the kitchen table with earphones on, listening to a lecture on his computer as he studied for his MCAT exams. Minutes before 11 p.m., three armed, masked men stormed into our Deerfield house through the open garage door. They headed directly to the kitchen, grabbed Noah, and threw him on the floor, face down. They tied his hands behind his back and bound his feet together. One of the gunmen took Noah’s cell phone and zapped it in the microwave. “How many are upstairs and where are they?” one of them demanded. “Two, I don’t know where they are,” cried Noah. While one gunman guarded Noah, the other two ran upstairs. I awoke to two gunmen who stood at the front of my bed and pointed their weapons at me. One of them was dressed in blue medical scrubs and a surgeon’s mask. The other wore sunglasses and a dark hat that covered his forehead and ears. “Who are you? Who are you?” I screamed and thought for a split second this must be a prank. I jumped out of bed and the gunman who wore the scrubs pulled down his mask and yelled, “Give me your hands.” He grabbed my arms and tied them together with large garbage bag ties. “Where’s the cash? Where’s the cash?” he screamed in a viscous tone. I was so scared I felt like I wasn’t even in my body. I cried out, “I don’t have any cash. Take me to the bank. I’ll give you all my money.” I remember thinking that I wanted them to take me out of the house so that they wouldn’t harm my children. But he slammed me into the nightstand and pushed me down onto the floor. He stood over me pointing the gun at my head. He seemed to be waiting while I just stared at the gun. Then the third gunmen looked in my bathroom and ran down the hallway. What I didn’t know was that Raquel had heard my screams. She’d locked her bedroom door and hid in the corner of her room. The gunman kicked her door open and barged into her room. He saw her crouched behind the dresser with a cell phone to her ear. As they bolted downstairs, I sprang up and left my room to watch them. I hoped they had all left the house. I ran back to the bedroom and managed to dial help with my arms still tied. Then I went to find Raquel. She stood in her doorway looking shocked and pale, but didn’t appear to be physically injured. A woman answered my call and I screamed “men just broke into my home. They had guns. Come quickly!” Raquel and I dashed downstairs and found Noah still bound on the kitchen floor. She ran to the cabinets and found a pair of scissors to cut him free. I darted to the front door and saw it was locked. I raced to the door leading to the garage and locked it. Emergency services were still on the phone. “Where are the police?” I wailed. “I don’t see them. Where are they?” I screamed. “Let him in,” she said and I hung up. The officer told us to come outside and led us to our next door neighbor’s house. We were shivering, shaking, and I felt sick. My neighbor let us in and gave us blankets and socks. The police taped the perimeter of my house. They spent the next couple of hours searching for clues and fingerprinting every door and handle. We were eventually driven to the police station. They took us downstairs to a small room and we all sat on a couch. Noah had his arms around me and Raquel sat closely at my side. I cried for my children having to endure this unfathomable experience; did they think we were all going to die? The detectives questioned us together and then separately for a couple of hours wanting to know both every detail of the home invasion and information about our personal lives. “Can we all sleep in your house tonight?” I asked Bobby. “Of course, I’ll get everything ready for your family,” he said and left. A while later, my ex-husband came to the station because Noah had called him. Again we were escorted upstairs by an officer to meet him. “Karen, your house has bad karma. You had a burglary years ago and now this,” he said. We finished answering all the detective’s questions and they drove us back home. Max had come over from his father’s house and was there waiting for us and hugged each one of us. “Look around and see if they took anything,” said the detectives. “Tomorrow you need to come back to the station for facial composites. Also, in the next few days, all of you, including Max, need to be fingerprinted,” said the detectives. By 3:30 a.m., my children and I drove to Bobby’s house and spent the rest of the night there. Raquel and I shared a bedroom once again while my sons slept in another room. I didn’t sleep that first night (or for many weeks afterward). In the morning, a security company came to change my locks and the following day, a wireless alarm system was installed. “You’re right, but it will take some time to heal.” I said. “Fine, I’ll give you one week,” she said and I smiled for the first time since the home invasion. Why would armed thugs want to invade my home? There is no money stashed here and I don’t work in a cash business or handle any cash transactions. Was it random? Maybe it was opportunistic? After all, the garage door was accidentally open. But I notice lots of homes in my neighborhood where the garages are left open. Could I have been the intended target? Did someone follow any of us home that day? These questions kept replaying over and over in my mind – day after day. Staying home alone during the day or night was not an option. I was terrified. When Noah and Raquel went back to school, friends came by to keep me company. Bobby’s golden retriever, Lucky, stayed with me during the day until I finally adjusted to being home by myself. My panic button was my safety guard, yet it felt like an albatross around my neck. It was a constant reminder of the home invasion. Bobby and I took turns sleeping at each other’s places. While he slept, I would lay awake listening to the noises inside and outdoors. Muffled sounds agitated me. I followed the movement of lights on the bedroom ceiling and walls as the cars drove by. If the lights slowed down or stopped, I ran to the side of the window and looked to see if a car had parked on the street. I was paranoid. If Bobby woke up to go to the bathroom at night, and I awoke seeing his silhouette, I screamed. My startling reflex intensified. I was scared of my own shadow. When my children returned from college, new rules were implemented in our house. If they came home after 10 p.m., they would call or text before they entered the house. What if someone was waiting in the bushes ready to hurt them? From my upstairs window, I watched as they walked up the driveway into the house. Being in my car felt safer but I always checked my rearview mirror to see if I was being followed. I would be on the lookout for strange cars parked in my neighborhood. My friends and family members suggested that I move. My house did not feel like a home so I put it up for sale. It sold within two weeks and I bought a condo in an adjacent suburb. A new beginning and a safer environment is just what I needed. Even with the prospect of moving, my nerves were getting the best of me. I couldn’t help but think about the day my father witnessed his mother and sisters taken from their home in Poland and beaten to death. My father, Avrum Jankel Szteinsapir, was born on May 21, 1921, and grew up with his family on a duck farm in the village of Rajgród, Poland, roughly 45 miles northwest of Bialystok. His father, Chaim Shlomo, died in January 1927 at the age of 52 from a stomach ailment — when my dad was only six years old. His mother, Beila, who was born in Jenova, Poland, had married Chaim Shlomo in 1913 in Rajgród. When her husband died, she was left to tend to the family farm and home with my father and the rest of her children. Gitel (Tova), my father’s eldest sibling, moved to Bialystok in 1927, and then moved to Lodz from 1933 until 1939 to take part in a training program for Jews who wished to settle in Palestine. Tova was a chalutzah, part of the Zionist pioneer movement, and went to settle in Palestine long before there was a state of Israel. Avrum’s other siblings included Chaya Esther, Leah, and Josephine, nicknamed Yoshpe. The youngest child was Yehuda Leizer, who died when he was two years old. I was named after Chaya Esther and Leah, the two older sisters, both of whom died in the Holocaust. Life was becoming increasingly violent for the Jews in Poland in the 1930s. Pogroms and riots against the Jews broke out in the bigger cities, and often the violence spiraled into the nearby smaller villages. On June 22, 1941 several townspeople of Rajgród, headed by the two Ukrainian workers my grandmother had hired, came to my father’s house to murder his family. When my son Noah interviewed my father about his life in Poland, my father described how he witnessed the death of his mother, and two of his sisters. He described how they were pulled from their home, and taken outside where his mother, Beila, pleaded with the murderers to kill her quickly. But they were without a shred of mercy, forcing her to suffer a long and drawn-out death. Yoshpe and Leah were also tortured and brutally murdered by the mob. My father managed to hide as he witnessed this unimaginable horror. He fled into the forest, where he spent most of the war years. Eventually, my father learned that Chaya Esther had died in 1942 when she was sent to Treblinka. 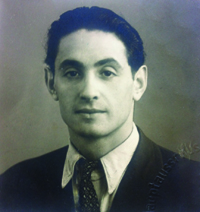 Tova, who had immigrated to Palestine, was his only sibling to survive the Holocaust. As for how my last name is Kaplan and not Szteinsapir, during the war, my father found a Polish passport and used it for identification during the times he would leave the forest and come to the city. The passport had the identity of a younger man whose name was Aryeh Kaplan. By assuming this identity, my father was able to pass himself off as too young to be sent to fight on the Russian front. His life was spared and so he decided to retain the Aryeh Kaplan identity; in fact, he used that name the rest of his life, though everyone called him Arie. Though my experience was nothing compared to what my father endured during the Holocaust, I was in a hyper-vigilant state of fear, just as he always was. Was I following in his footsteps destined to be paranoid and fearful for the rest of my life? Was I continuing a centuries-long heritage of fear and victimization? Was it ever going to be possible to let this go and move forward with grace and ease? A couple of months passed and I was feeling less vulnerable and more secure. But I noticed that my fear was morphing into anger. I wanted those bastards caught and visualized them rotting in jail. How dare they threaten my family? How dare they scar my children for life? I wanted justice and I wanted it now. Each week I contacted the sergeant and detectives at the Deerfield police station hoping for new information on my case. The fingerprints came back negative with just traces of my daughter’s prints on her cell phone. Each day I checked the internet for the latest articles involving current arrests of home invaders in the Chicago area. I looked at countless mugshots online, but my case was still a mystery. These thugs are roaming the streets, I thought, and terrorizing other families. They must be stopped and held accountable for their crimes. Again I thought about my father focusing his entire life on revenge and plotting the deaths of Kordash and Jablonski, the two Ukrainian workers who murdered my grandmother and aunts. He never discovered what happened to them, but after my father died, my cousin Avi, during a visit to Rajgrod, learned that Kordash and Jabolonski had been killed by the Polish resistance in 1946. So my father had spent decades plotting the death of men he didn’t know had been dead since 1946. I realized that the criminals who invaded my home might already be serving a jail sentence and that I may never know. What I do know is that I eventually became tired of feeling scared, anxious and paranoid. Tired of feeling bitter and angry. I recognized that fear and anger would consume me if I let it persist. I didn’t want to be just a survivor or a victim. I wanted to be able to go outside at night and return home without fear. I wanted to live my life with fortitude, hope and optimism. Amidst all these feelings, a bewildering question echoed in my mind. Why did this incomprehensible experience happen to me? Maybe it was a divine plot designed to test whether I can recover from a traumatic episode. Maybe this was my ultimate test of forgiveness … to forgive those who might have raped and murdered my children and me. I cried knowing that my children were deeply traumatized and yet part of me was grateful that they were home that evening. If not for them, I may not be alive today. People who have bumped up against evil are often consumed by what should happen to the evil-doers. Sometimes they even get bogged down fantasizing about revenge in addition to demanding justice. My father, for example, spent his whole life in a place of darkness and never even considered the idea of moving on. He was paralyzed by his feelings and his quest for compensation. My father could never let go of his past and each member of my family suffered as a result. We too became victims of the Holocaust. Letting go of rage and forgiving those who had harmed him would have changed his outlook on life and its domino effect on the next generation. 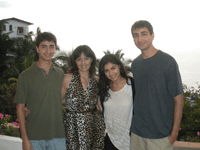 After 21 years raising my three children in my Deerfield home, I wondered, as I moved into my new condo, if I would be able to create a new home for my family filled with laughter and joy? Could I rise above this trauma and allow myself to feel peace in my heart? I know looking to the external was not going to help any of us; the answer was deep in our cores. Others have said this in different ways, but the truth is that we can’t affect the world by holding onto anger and fear. The only thing we can change is what’s inside of us. I knew I needed to return to the peace and contentment that once resided within me, to channel my fear into positive thoughts, and to remain calm and centered. I knew I wanted to overcome the pessimism and defeatism that plagued my father throughout his life. I want to honor my ancestors. I want to give hope to the next generation. I forgive those home invaders.